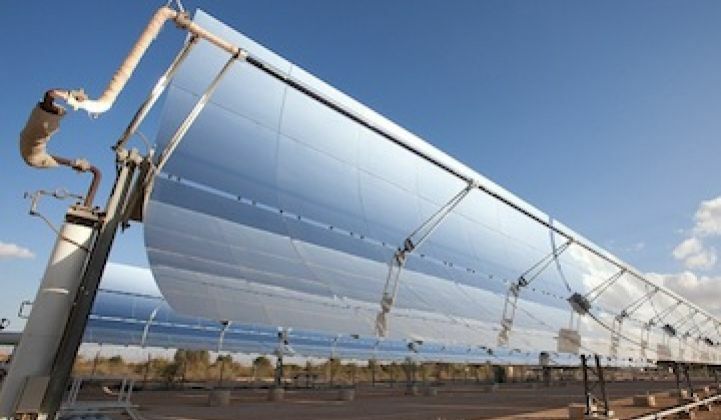 Three years after buying parabolic trough concentrating solar company Solel, Siemens says it is getting out. If you don’t mind a little risk, it might be a good time to be buying solar businesses. Lots of sellers out there. The latest to join the get-out-now club is the German industrial giant Siemens, which said on Monday that it would sell off its solar businesses, led by a concentrating solar power unit that was caught with a technology losing popularity in a stagnant market. It was just three years ago this month that Siemens announced it was spending $418 million to acquire Solel Solar Systems, a company that had been doing well selling components for utility-scale parabolic-trough solar thermal plants, particularly in Spain. These plants consist of long rows of curved, sun-tracking mirrors that focus sunlight on a fluid-filled receiver tube running directly above the mirrors. The heated fluid is then used to create steam to drive a generator. But it wasn’t long after the Solel acquisition that the utility-scale solar market began to shift. Plunging panel prices made photovoltaics a good option. And even where the concentrating/thermal model was preferred, power tower technology -- using arrays of big mirrors to focus sunlight on a giant tower -- often moved to the fore. We see such towers going up in California, with BrightSource’s big Ivanpah project, and SolarReserve is at work on the Crescent Dunes plant in Nevada. More power tower plants are crowding what Siemens said was a shrinking pipeline for concentrated solar. “The global market for concentrated solar power has shrunk from 4 gigawatts to slightly more than 1 gigawatt today. In this environment, specialized companies will be able to maximize their strengths,” Michael Süß, CEO of Siemens' energy sector, said in a statement. Solel founder Avi Brenmiller is said to be considering making a bid for his old business. Brenmiller told Reuters that his new company, Brenmiller Energy, is looking to pair thermal solar with natural gas in power plants. That would make for a steady supply of energy and, depending on the market, could bring down the cost (gas is cheap in the U.S., but not everywhere). And price is, always, the market driver. Still, it is important to note that while the solar sector is grinding through a torturous realignment after building wildly excessive capacity, and demand growth has slowed, more and more solar continues to be installed.